This brief and user-friendly resource is an excellent guide for new Christians desiring to begin growing in their walk with Christ or for stagnant Christians that might suddenly realize they're not growing in their walk with Christ. I have already mentioned in a previous post of my admiration of R.C. Sproul. In this short book, Sproul identifies five crucial “nutrients” that promote spiritual growth: Bible study, prayer, worship, service, and stewardship. I don't know how to summarize this book adequately in a few sentences. It has won countless awards, it is used all over the world in theological schools and seminaries, and it is perhaps the best book on the spiritual disciplines out there. I can put it to you this way: Nearly everyone who attended seminary in the last 25 years has probably read or at least purchased this book. Richard Foster, the books author, comes from a Quaker background, but you certainly don't have to agree with every little statement or opinion of his to get enormous insight from this book. Written over five centuries ago by Thomas à Kempis, The Imitation of Christ has been translated into more languages than any other book except the Bible (according to the back cover of my copy). It has been acclaimed by countless readers as one of the greatest spiritual masterpieces ever written. John Wesley considered The Imitation of Christ to be of such value to spiritual growth, and the best summary of the Christian life, that he personally translated it for the use of his followers. This book was instrumental in the early Methodists' revival of England. There's a reason this book has stood the test of time...it's certainly a Christian classic. Beloved author C. S. Lewis is our trusted guide in this intimate day-by-day one year companion offering his distinctive and celebrated wisdom. Amidst the bustle of our daily experience, Lewis writes about themes such as the nature of love, the existence of miracles, overcoming a devastating loss, and discovering a profound faith. These daily meditations have been selected an put together from Lewis's celebrated classics: Mere Christianity, The Screwtape Letters, The Great Divorce, The Problem of Pain, Miracles, and A Grief Observed, as well as from the distinguished works The Weight of Glory and The Abolition of Man. Throughout the book, the reader will also find biographical commentary about C. S. Lewis's life. 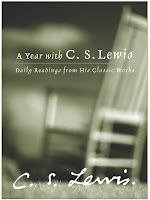 A perfect resource for everyone who cherishes Lewis's timeless words. Dietrich Bonhoeffer was only thirty-nine when he was executed by the Nazis in 1945, yet his influence on Christian life has been enormous. His passionate, theology-based opposition to Hitler's Nazi regime made him a leader, along with Karl Barth, in Germany's Confessing Church. Bonhoeffer is embraced by both liberal and conservative Christians, and the integrity of his faith and life have led believers everywhere to recognize him as one of the greatest theologians and philosophers of the twentieth century. This book showcases his letters, sermons, and writings--which are a treasure of spiritual wisdom, social conscience, pastoral care, and theological insight--in a one year daily devotional format. This resource is sure to encourage and deepen your reflections and meditations. There's even a foreword by Jim Wallis, author of God's Politics. Bonhoeffer's faith led him to lay his very life down and his influence will forever continue. (As an aside: Other titles by Bonhoeffer that would be good to read and grow in Christ include The Cost of Discipleship and Life Together). Theology is important because what we believe affects how we live. Wayne Grudem's beefy textbook Systematic Theology has established itself as a foundational reference in the evangelical church today, prized by pastors and teachers everywhere. But this is not that book. Instead, this is a very readable condensation of Grudem's award-winning book on systematic theology. It is a reader-friendly guide to Christian doctrines--for new believers and all Christians. If you're a relatively new believer in Jesus, or if you're a more mature Christian looking for a quick brush up on basics of the faith, Christian Beliefs is a great resource. The message of this book is that: Far from being legalistic, restrictive, or binding, as they are often perceived, the spiritual disciplines are actually the means to unparalleled spiritual liberty. So if you'd like to embark on a lifelong quest for godliness, Spiritual Disciplines for the Christian Life will help you on your way. Based on the rich heritage left us by the early church fathers, the Puritan writers, and Jesus Christ Himself, Whitney takes you through a carefully selected array of disciplines that includes Scripture reading, prayer, worship, Scripture meditation, evangelism, serving, stewardship, Scripture application, fasting, silence and solitude, journaling, and learning. By illustrating why the disciplines are important, showing how each one will help you grow in godliness, and offering practical suggestions for cultivating them on a long-term basis, this resource will provide you with a refreshing opportunity to embrace life's greatest pursuit--the pursuit of holiness--through a lifelong delight in the disciplines. Whitney currently teaches at Southern Baptist Theological Seminary in Louisville. This is also the book that probably most closely approximates Celebration of Discipline. Ten Questions to Diagnose Your Spiritual Health - The title of this books pretty well describes it. Whitney poses intensely introspective questions to aid Christians as they gauge their own level of spiritual health. Do they have a driving thirst for God, as well as behavior dictated by God's holy standards? How loving to others and sensitive to the Holy Spirit are they? Do they experience genuine grief over personal sin and a willingness to forgive repeat offenders? Whitney also discusses the spiritual disciplines of prayer, fasting, meditating upon Scripture, and so forth, showing readers how to transform these often routine rituals into faith-building activities. He advises Christians to spend more energy enjoying God and developing a Christlike nature and makes readers aware that following Christ is a lifetime commitment. This book is great for unearthing deeply entrenched habits and digging for the treasure found only in a carefully-kept relationship with God. By the way, I apologize if some of these descriptions read a bit like a sales pitch. That is because I used portions of the books' own descriptions to formulate my own, tweaking things here or there. It's not plagiarism because 1) I am telling you what I did; 2)Who is going to argue that the books are REALLY about what I have said. If anything I have tried to be more faithful to the books themselves by using their own descriptions; and 3) What writer or publisher would have a problem with me showcasing their books and suggesting them as resources? This entry was posted on 8/21/2009 and is filed under Discipleship , Godly Priorities , Growing , Resources , Where Do I Start? . You can follow any responses to this entry through the RSS 2.0 feed. You can leave a response, or trackback from your own site.